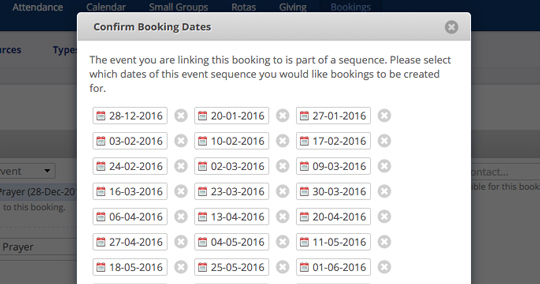 Bookings sequences are a really easy way to group together all bookings for the same event, or purpose. Sequences save you the hassle of going through each individual booking and editing or deleting details. 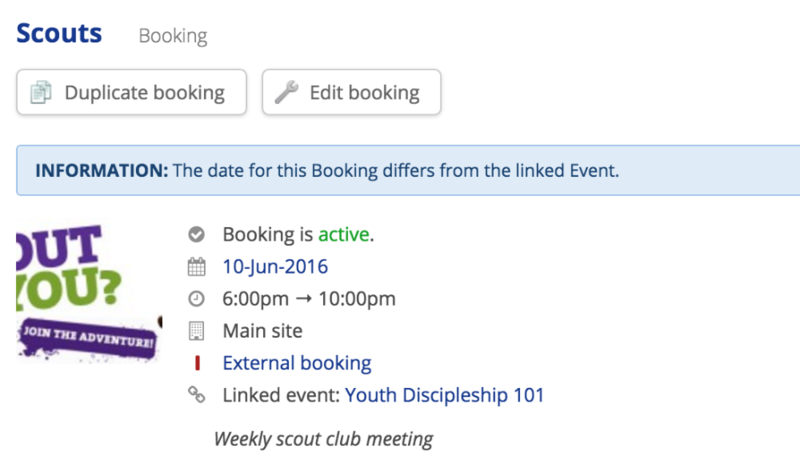 If your booking is linked to an event in the Calendar module, then ChurchSuite will pull across all the details of the event. 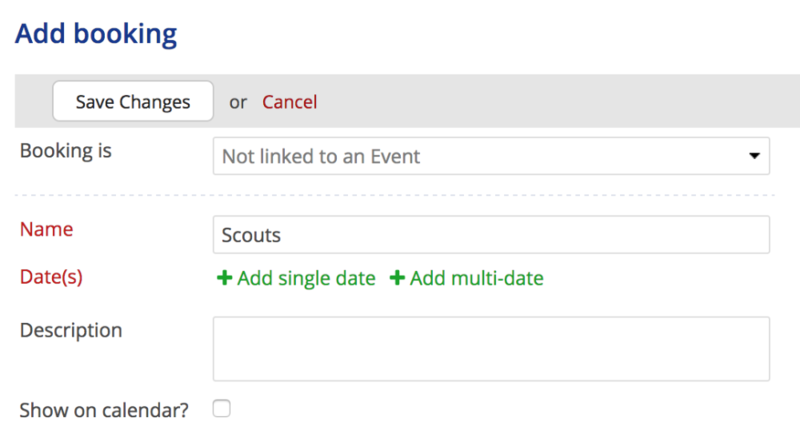 And if the event you link to is part of a sequence, ChurchSuite will give you the option to create a linked booking for each of those dates - essentially creating a booking sequence that matches your event sequence. When you create an unlinked Booking (i.e. not linked to events in your Calendar module) with multiple dates, ChurchSuite will automatically create them as a Booking sequence. This can be helpful when changes need to be made, as the changes can be made to some or all of the sequence, without needing to change each individual booking instance. For those times where you already have a single date 'standalone' booking, but later decide that you want to add other dates to booking; you can duplicate from that single date booking to create a new booking sequence. To do this, locate your original Booking in "Bookings" > "Bookings" and select 'Duplicate booking'. This will then take you to the 'Add Booking' screen and will auto-fill the details from your original booking. To create a booking sequence from this, simply click to add dates - either "Add single date" or "Add multi-date". Please note: As you have duplicated the original booking details, the original booking itself will not be included in the new Booking sequence. To ensure all dates are included in your sequence, make sure to include the original booking's date when duplicating. This will likely cause a clash notification to appear when you save the new sequence - which is expected. However, simply go to "Bookings" > "Bookings" and delete the original, non-sequenced, Booking that you duplicated from. This will also remove the clash. 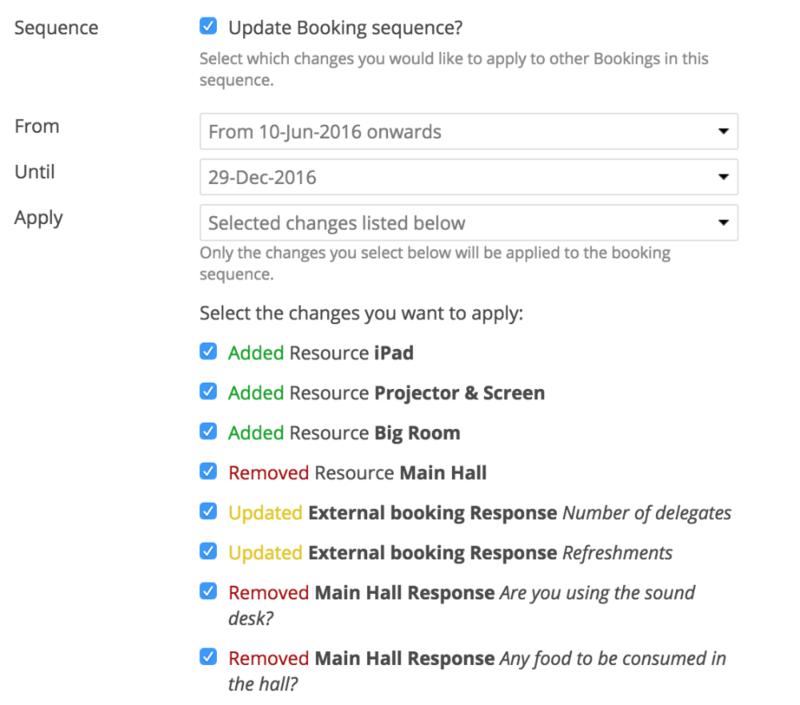 When making changes to a multi-date sequence booking, you have the option to select 'Update Booking sequence', allowing changes made to the booking to also be applied to some or all of the other bookings in the same sequence. Making changes to one booking in a sequence does not affect the rest of the sequence unless "Update Booking sequence" is selected. When you select "Update Booking sequence? ", you then have a number of options, giving you lots of flexibility to select which changes are to be applied across the sequence, and which sequence dates the changes apply from and to. Care should be taken when adding dates to booking sequences that are linked to events in your Calendar module - it's essential that the extra event dates are first added to the event sequence in the Calendar module, before adding dates to a booking sequence - this step is necessary so that you can link the added booking dates back to the added events in your Calendar module. 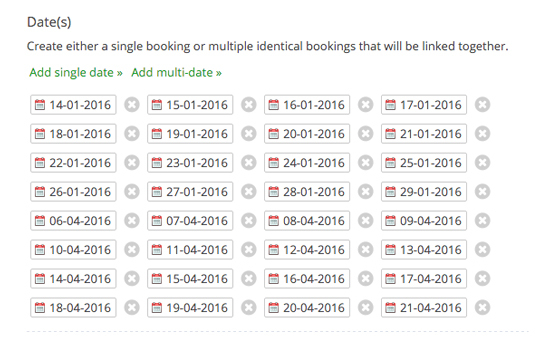 Linking added booking dates to wrong events will result in mismatched dates between your events and bookings! When viewing a booking, and using the action cog in the "In this sequence" section on the right hand side of the page, select 'Add to sequence'. However, if the existing booking sequence is linked to an event sequence, the "add booking" page will default to adding a linked booking to the sequence (see below). Note that event related to the booking is pre-selected based on the booking you were viewing when you selected "Add to sequence". You must click the 'x' to unlink this event and search and re-link to the correct sequence event date for your new booking. When you select the correct event, you will also be prompted to create other bookings - click cancel, as you only want to create this one instance. Click "Add single date" or "Add multi-date" to add the booking date(s). Click to save your booking and your sequence will be automatically updated to include the new date(s) - all booking details, like resources and booking types, are also automatically added to your new booking dates(s). The "meta" panel on the right hand side of the booking page lists all the new sequence information and shows any linked event for that booking. You can delete an individual booking within a multi-date sequence without affecting the rest of the sequence. Simply open the booking you wish to delete and click 'Delete' in the top right corner of the page. Only that one booking date is removed; the rest of the sequence remains unchanged. 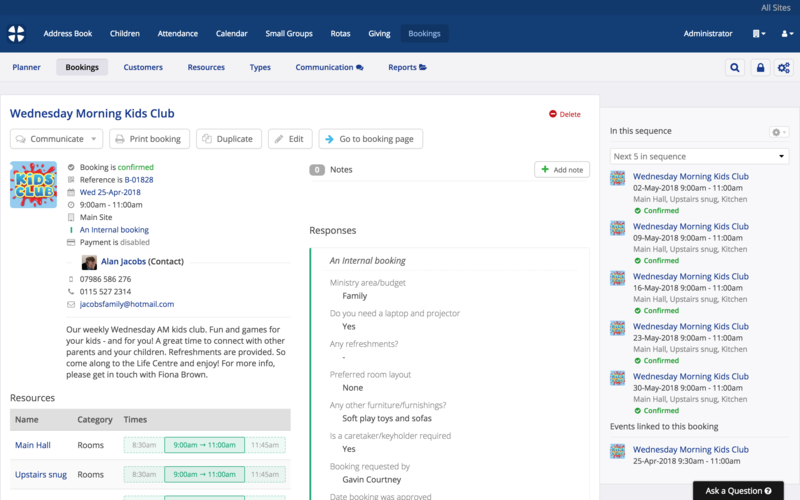 If the booking is linked to an event, you'll have the option to delete any linked event too, including all data associated with the event, such as sign-ups and any event question responses. ...and again, the option to delete any linked event too, including all data associated with the event, such as sign-ups and any event question responses. The "Delete" confirmation prompts you to confirm the deletion. If you wish to delete "Past" bookings, switch from "Future" bookings to "Past" bookings and repeat the process of selecting one or more or all "Past" sequence event dates and then selecting "Delete" from the batch "Actions" menu. Remember to delete the event sequence in the Calendar module too, if that's also necessary. When working with Bookings that are linked to Events in your calendar (e.g. internal bookings for your church's events), be careful when making changes to the booking dates/times or event dates/times. Be sure to update the date/times change in both modules. This is especially important when linking a booking to an event after the booking has been created. If a linked booking or linked event has different dates, an information message is displayed at the top of both event page and booking page, so you can correct the discrepancy. The "Mismatched Events' report in the Bookings module > Reports also provides a complete list of any bookings and events that are mismatched. If in any doubt, the safest and easiest workflow is to create event sequences first, and then use the "Add booking" button at the top of the event page. Using this method will ensure a matching booking sequence is correctly created for the even sequence. If you later need to extend a linked booking sequence, always begin by adding the date(s) to the event sequence, before extending the booking sequence - then you will have correct events to link your extra booking dates back to.